Timers for the Classroom – Vol 2! 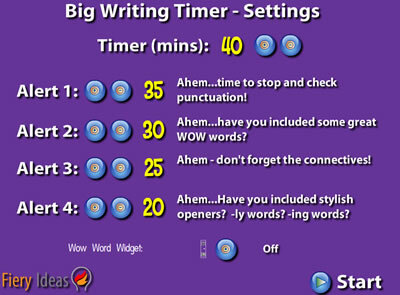 Back in 2009 I wrote a post on Using timers in the Classroom. Things have moved on a lot since then, some of the ones on the old post are no more and I have just found a few other great timers so I thought I’d do a quick update with a new post. I hadn’t seen this timer before but this is from the fantastic Classtools.net – it is brilliant! I love the fact you can add multiple timers and you can either run them all at once if you have different groups being timed in different ways, or they can run in sequence! I am looking forward to using these to help my Year 11s practise their timing when completing exam questions. You can also add tunes and youtube videos to your timers! One of my favourite features is the fact that you can save weblinks to your customised timers so you can set things up in advance and have a range of timers set up and saved for a variety of purposes.